This note is an annotated, illustrated version of a Chapter 8 section of the book Emergency Navigation, called Finding the Sun as a Viking Would. This note comes to be written now because we had made a (cryptic) Youtube video on this topic some years ago for the students of our online course in emergency navigation, and frankly it was not very clear what was going on in the video without the background of the course or that book. But the video gained some attention and several commenters ask for clarification, so this is an attempt to do that. It is frankly a pretty neat technique, so I can appreciate the frustration of not knowing what was going on in the video. Something seemed to be working (according to the narrator, me), but it was not obvious what! Leif Karlsen, in his book Secrets of the Viking Navigators, gives a good argument that the Vikings used crystals of Iceland spar to ﬁnd the direction of the sun when just below the horizon or when obscured by fogbanks on the horizon, common at latitude 60° N where they did much of their ocean sailing. The technique he proposes works very well. We have done it many times using these Viking sunstones, which are readily available from gem shops online (you need a clear crystal, 1 to 2 inches on a side). This technique can pinpoint the direction to the sun to within a few degrees, and it was in fact used for many years in a more sophisticated arrangement as the basis of the Kollsman Sky Compass in the early days of polar exploration by air. Leif’s original instrument is still on display and the Nordic Heritage Museum, just around the corner from Starpath HQ. I had the pleasure of working with Leif on the project for many years. His study is the definitive work on the most likely way the device was actually used in Viking times, but we had to publish a special peer-reviewed article to confirm his right to this claim. You can simulate the sunstone method with about the same precision using any polarized ﬁlm, such as the lenses of polarized sunglasses or some polarized camera ﬁlters. Some older sextant models also have polarized ﬁlters on the sunshades. In addition to that, you need a small piece of cellophane. Many clear packaging tapes, the transparent windows of a CD sleeve, or the protective packaging of many products are often cellophane. On the other hand, some clear plastic products that look like cellophane, are actually another type of plastic and will not work for this application. To prepare the lens, attach a piece of cellophane diagonally across the lens as shown in the left inset in the graphic below. Look through the lens with the cellophane on the far side (sky side) of the lens. The lines with the arrowheads in the ﬁgure represent the edge of the cellophane, crossing the middle of the lens. Figure 8-4 from Emergency Navigation. The bottom left inset shows a cellophane tape on the glasses; the bottom right inset shows the direction to look. The top part shows 3 examples of applying this technique. The middle one is what you see when looking in the right direction. The three images of that group would be on top of each other when actually yawing the orientation to the right and left of the true sun direction. The groups on either side of that show what it looks like if you are not quite looking in the right direction when you yaw the device to the right and left. You still find the direction to the sun, but it is not as easy to locate that on the horizon. Start by looking in the direction that is opposite to your best guess of the sun’s bearing. You will not know exactly where to look, as that is what you are trying to discover. Once facing that best-guess direction away from the sun, angle your view up from the horizon by an amount that you estimate would put you about 90° from the line straight to the sun. Referring to the right inset, if you point to where you think the sun is, your thumb will point in the best direction to start looking for maximum polarization. If the sun is just on or below the horizon, you would look straight up. If the sun is about 30° above the horizon, you would look in the opposite direction at about 60° above the horizon. 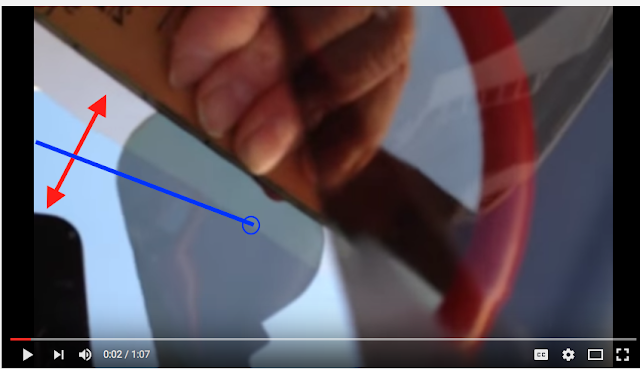 In the video example, we used inexpensive polarized sunglasses that had no frame at all (Bartells in Ballard), it was just one piece of plastic formed into glasses. The we just cut them in half. I think we used the clear packing tape we get from U-line, and taped a strip across the glass diagonally as shown. Then you want to hold this up and look at the sky through the glasses and tape (tape on the opposite side you are looking at), but you do not look in the direction you think the sun is—even without seeing it (already set or obscured) you know very roughly the direction to the sun. Rather, you want to hold this up in the direction that is 90º from that direction. In other words, it the sun had just set (roughly the case in the video), then you would be holding this up, looking directly overhead. For cases when the sun is overcast or behind clouds but not near the horizon, then you would look in a direction opposite to the sun at an angle from the sun as illustrated in the picture. An important requirement is that this direction you are looking, i.e. 90º from the estimated sun direction, has to have some clear sky. If you look 90º from the sun and it too is covered by clouds, this will not work. Thee can be some level of overcast, but there must be some level of clear sky in that direction. The closer you are to looking at 90º to the actual sun, and the clearer the sky is in that direction, the better it will work. 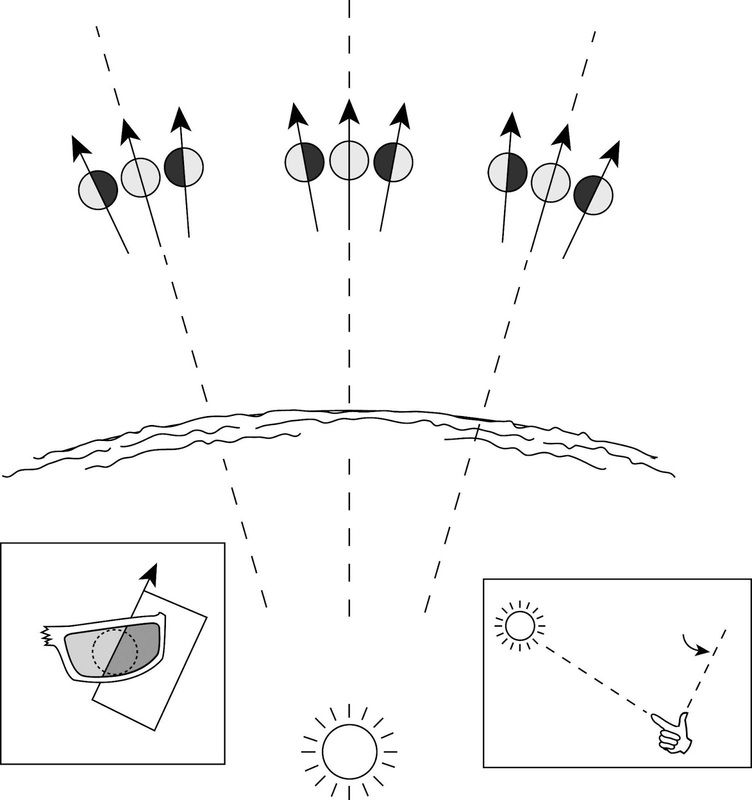 The three center group of drawings in the picture above show what you will see when you are facing the proper direction of maximum polarization, directly opposite the true bearing to the sun. When the cellophane edge is perpendicular to the horizon, the lens will be the same shade on both sides (cellophane side and no-cellophane side). When you rotate it slightly to the right and left (that is a yawing motion), the sides will change brightness, as shown in the two ﬁgures adjacent to the center one. There are three groups of pictures here, we are talking now about the middle group, which is what you see when you are looking in the proper direction. The two rotated views are shown to the right and left (in the center group), but they would actually be in the same position as the middle one, just rotated to the right or to the left. The video will illustrate what we actually see. On the other hand, if you are not facing opposite the true direction to the sun, you will see what is shown on the right or left of the center ﬁgures. If you are facing to the right, the edge of the cellophane will lean right when the sides have the same brightness, as shown, and when facing to the left of the proper direction, you will see what is shown on the left. In short you can find the direction to the sun even when pointed slightly wrong, but you will not get a good vertical line as shown in the middle group, which takes more judgement on locating the bearing on the horizon. This is a subtle process that takes some practice… and patience. But once the procedure is grasped, it can then be repeated much more readily. The sequence is: Look in the approximate right direction and then in the approximate right elevation. Then, starting with the cellophane edge perpendicular to horizon, rotate the lens to ﬁnd the orientation of that edge line when the two sides are about the same brightness. When you are in about the right direction, the two sides will switch in brightness quite prominently—providing you do indeed have a polarized ﬁlter and true. I have always found when using the sunstone or these glasses in a hand held mode—as opposed to the device Leif invented for using a mirror—that it is easier and more accurate to hold a ruler along side the crystal or in this case the polarized glasses. The ruler enhances your perception of the yawing motion for better precision. Also in the video I also used a mirror. I just held the ruler and glasses up in one hand overhead and looked at it with a mirror in my lap. These modifications are (very crudely) sketched in the pictures below. (I will improve these when we can.) Also shown below is an illustration of the right direction to look. You can try both methods to see what works best for you. Just looking up works fine and is likely best. We used the mirror just so someone could make the video. Here is the video showing an actual measurement. The screen caps preceding it below show what is meant by "right" and "wrong" heard in the video. This is just after sunset, with a bright patch on the horizon to locate sun direction as a test. It is using a mirror facing straight up to view the glasses that have a piece of cellophane tape pasted diagonally across the glass. This can be done without the mirror by looking straight up to the taped glasses, but i could not take a video of it that way. The video was taken with an iPhone. This is a modern version of using polarized film (cheap clip-on sunglasses, cut in half) as a Viking sun stone (Icelandic Spar). It is a way to find the direction to the sun after it has set or when it might be behind a cloud bank. Maximum polarization is in a direction 90º from the sun direction, which is straight up with the sun near the horizon. I am holding a meter stick along the edge of the cellophane tape to enhance the rotation angle, which helps pinpoint the direction. 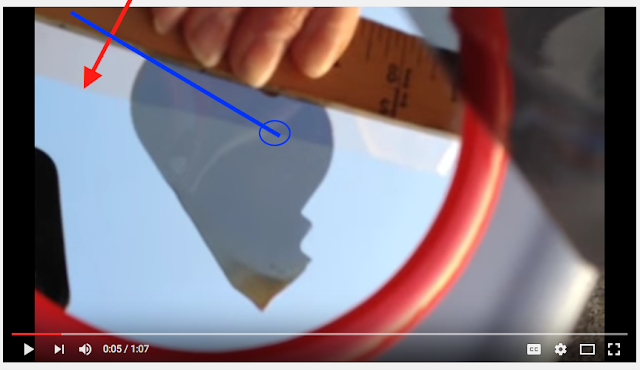 When you watch the video, I am rotating the ruler and glasses to the right and left and noting which side is dark or light, and when the two sides are the same brightness, the the edge of the cellophane and in this case ruler are pointing to the sun... which was set below the horizon for some period of time as i was doing this. I was using a mirror in this case only so i could make the video, which would he hard to to looking up. In this case a friend was taking the video over my shoulder looking down at the mirror. Doing this on your own there is no need for a mirror. It just gets in the way. By the way, the obvious way to practice is do it (without a mirror as you can then see where you are pointed, and do it just at or after sunset so you know indeed what is the right answer. Too far right. One side is darker than the other. Just right, both sides same color. The Ruler is pointed to the sun, even though the sun is not viable at the moment. It could be set (as in this case) or obscured behind a fogbank or clouds. Too far Left. One side is darker than the other. This technique works because scattered sunlight is polarized. If you imagine a line straight up to your zenith and another line straight toward the sun, then these two lines deﬁne a plane. The electromagnetic oscillations within sunlight that have been scattered by air molecules are perpendicular to that plane, whereas in direct sunlight these oscillations are randomly distributed in all directions. 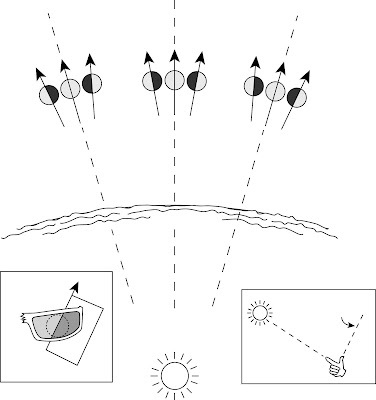 Sunlight that has been reﬂected from a surface (glare from the water, for example) is also polarized, which is the motivation for polarized sunglasses. This light is horizontally polarized parallel to the reﬂecting surface, which means that sunglasses designed to block this glare are vertically polarized. An easy way to test that a pair of glasses is polarized is simply to look at such a reﬂective glare and rotate the glasses (looking straight through the lenses to the glare, roll the lenses, without pitch or yaw), and you should see the intensity of the glare change quite noticeably. On land you can do the same with bright glare from a window or car hood or bumper. 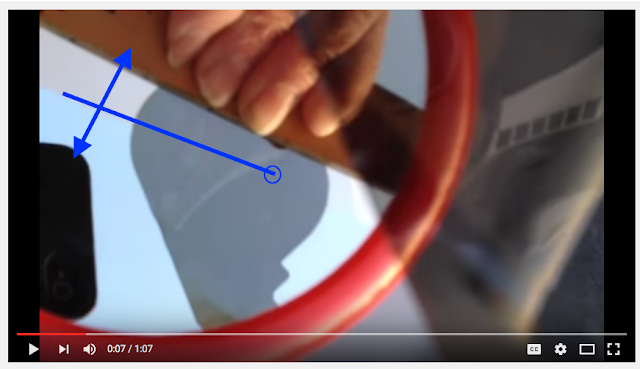 When the glasses are working properly, you can see though the glare-producing windshield into the car; without them, or with your head turned 90°, you see only glare. If you are using a lens of a pair of sunglasses, chances are the polarization axis is parallel to the bottom of the glasses, which means you will ﬁnd the brightest or darkest light transmission with the lens parallel or perpendicular to the horizon. If this is not the case, ﬁnd the best orientation and draw a line across the bottom of the lens when rotated into the darkest or brightest orientation—or mark the horizon with a piece of tape if you don’t have the right pen for the job. When you attach the cellophane it should go diagonally across that axis. Once you have this "polarization compass" assembled, look again to the correct direction and rotate the device. You will notice now that the right and left sides alternate in brightness; when the two sides have the same level of brightness, the edge of the cellophane is pointing to the sun. The trick is to hunt around for the best direction; rotate the compass, note the sharpness, turn left a bit, try again, turn right and try again. When the angle is optimum, look up a bit and then down, etc. As shown in Figure 8-4, you are ﬁnding a great-circle arc that points to the sun, so when looking to the left of the proper vertical plane, the line will point right, and when looking to the right of it, the line will point left. Once you ﬁnd it with access to clear sky at 90º, the location of the brightness transition becomes very sharp. In short, this really works well. After coming back to this video because of the several notifications we were getting here, I looked around at other videos online about the use of the sunstone itself. There are quite a few. They vary from almost right, to totally bizarre. I will try to get help and make a quick video of how to use an actual sunstone for this purpose. It is easier than this.